* In what has become a recurring storyline, Taylor Jordan dominated on the mound as he tossed a complete-game shutout against the Richmond Flying Squirrels. Jordan flirted with history as he took a no-hitter into the sixth inning, ultimately allowing five hits on the evening. Jordan is now 5-0 for Harrisburg with an ERA of 0.66. Yeah, you read that right…0.66. * Jordan has now thrown back-to-back shutouts as he’s run his current scoreless streak to 19 innings. The last run he allowed was in the fifth inning against Trenton on 6/2. * When Caleb Clay threw his complete-game shutout it had been almost eight years since a Harrisburg pitcher had thrown one. Jordan’s took considerably less time as it came a mere 12 days later. * In 13 appearances between Potomac and Harrisburg, Jordan has thrown 77.1 innings and allowed only eight runs (for a 0.93 ERA) on 56 hits. * Not only was Jordan the star of the night on the mound, but at the plate as well. Jordan collected his first professional hits as he went 2 for 3 with a run driven in and three runs scored. * The win secured the Senators first three-game home sweep since June 26th, 2011 when they completed the feat against the Altoona Curve. * Portland’s 2-0 win over Erie coupled with the Senators’ victory moved Harrisburg into a three-way tie for first place. 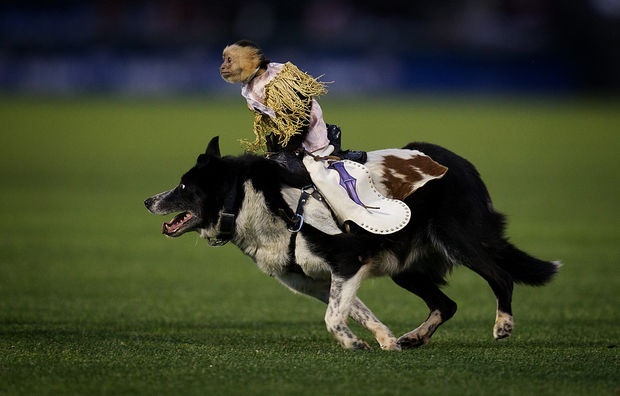 * Another year, another cowboy monkey rodeo. I wish I knew how to quit you. This entry was posted in Recaps and tagged cowboy monkeys, Taylor Jordan. Bookmark the permalink.